Lace up for the #Modo8k! Can you feel the excitement? The second annual Modo 8k is only days away, and we're preparing for another beautiful run around Stanley Park. 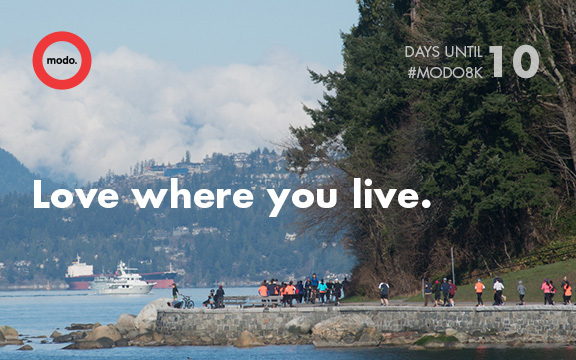 On March 22, an estimated 1,300 runners of all ages and levels will hit the Seawall in the morning, followed by the annual Modo Community Fair to celebrate this healthy connected city we know and love. Join us for this family-friendly event – everyone welcome! Register to run the Modo 8k by March 16 and get 20% off race registration (promo code MODO8K-MEMBER)! Modo's board absolutely supports a "Yes" vote on the upcoming Metro Vancouver Transit Referendum. We know that critical improvements in transportation infrastructure are needed to support the pressures of a growing population, with a wide range of benefits that will last well into the future. The majority of our members depend on public transit every day, and the future of our co-op depends on more people in our region being able to do the same. If the investment isn't made now, any gains we've made in reducing road congestion will be lost. And fewer of us will be able to rely on transit and carsharing for our transportation needs. We have before us a significant opportunity to influence the region's future, and we encourage you to get educated about the transportation investments, upgrades and services a YES vote will bring. On our blog, we've compiled a list of videos, articles and resources for your reference - check it out! If you have a link you want to share, tweet 'em at us: @modo_carcoop. You don't have to run the Modo 8k to join the Modo Community Fair on March 22. The fair features live demos, interactive displays and resources connecting you and your family more deeply to our city. Booths include kids' activities, a Pop-Up City Hall, canoe carving, bike maintenance how-tos, park ecologists, new sharing economy technologies and more! As well, Take a Hike students will be selling tickets for breakfast wraps from Stanley’s Bar & Grill, with proceeds going toward their next wilderness excursion. See you at the #Modo8k! The latest in our Modo 'How To' series has arrived and it's all about our fully electric Nissan Leaf! Watch it and more 'How To' videos (including our Stow-n-Go van) on our YouTube channel. >> #LETSMODO A group of French ex-pats packed up their Modo and headed to Revelstoke in search of fresh powder. >> VICTORIA NEWS Victoria members who haven't yet picked up a Modo fob must ensure their address is up to date on their online account. >> WASH UP Score free driving when you pitch in to help with our spring cleaning! Find a 2015 red Fiat 500 (#600) instead of a 2012 Toyota Matrix. Although it looks very similar to the previous car, the new 2015 red Fiat 500 (#599) is an Abarth sports car. Find a 2013 silver Fiat 500 (#510) and a 2014 white Dodge Ram Promaster cargo van (#573) in front of 5828 Thunderbird Boulevard, in a designated stall on the street. A 2015 white Nissan Versa Note (#664) has replaced the 2010 Nissan Versa hatch. A 2015 white Mazda 3 Sport (#656) has replaced the 2012 yellow Fiat. Find a 2015 blue Nissan Versa Note (#665) and a 2015 green Toyota Prius C (#674) instead of a 2014 Note and a 2010 Honda Insight. Find a 2015 white Dodge Ram Promaster cargo van (#598) instead of the previous 2014 model. A 2015 red Nissan Micra (#663) has replaced the 2010 Nissan Versa hatch. Find a 2015 silver Nissan Sentra (#657) instead of the 2013 red Sentra. Find a 2015 red Fiat 500 (#597) instead of a 2013 silver Fiat. A 2015 grey Nissan Sentra (#658) has replaced the 2012 Toyota Corolla. A 2012 red Toyota Matrix (#392) has replaced the 2009 orange Toyota Matrix. Find a 2009 orange Toyota Matrix (#263) in place of the 2006 Yaris. There's now a 2015 white Toyota Corolla (#659) instead of a 2013 Nissan Sentra. A 2015 red Toyota Prius C (#651) has joined the green Mazda 2 until its permanent home is ready. A 2015 blue Nissan Micra (#678) has replaced the 2014 red Versa Note. There's now a 2015 blue Nissan Micra (#661) instead of a 2011 Mazda 2. A 2015 blue Mazda 3 Sport (#655) has replaced the 2010 Toyota Corolla.